I have had it considerably easy since almost all of my health concerns are invisible 90% of the time (or they’ve been temporary). It gets much more difficult if you happen to have a disability that is obvious at the interview. It’s unfortunate but some employers dismiss disabled workers without even addressing their qualifications or giving them a chance. I’ve read numerous articles about the issue and one thing I’ve seen mentioned over and over again is how dedicated disabled workers are. It seems to imply that employees with disabilities are so thankful just to have a job that they are harder working and more loyal than a non-disabled employee. To be fair, I don’t have any statistical or anecdotal evidence to back that statement up on either side, but it makes me twinge a little bit every time I see it; I don’t like the underlying implications. However, there are some positive skills related to disability that I can get on board with 100%. Sarah Blahovec, for example, wrote an excellent cover letter that highlighted her disability-related job skills. 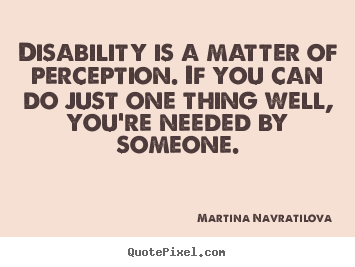 Dear Hiring Manager, I am not my disability, but my disability is a part of me. It causes complications in my life, but the ways in which I have overcome those obstacles should carry more weight than the obstacles themselves. I love that Sarah focuses on the skills she has developed due to having a disability and not on the disability itself. It emphasizes that we all have strengths and weaknesses, disabilities or not, and each job should be filled based on who can fill the role the best and not based on how the candidate acquired their skills. As much I understand and agree that everyone should be able to do what they love, it would be remiss of me to ignore the other side of the issue. When I was being discriminated against based on my disability I couldn’t help feel a little bad myself. I certainly do not condone discrimination in any way, but I can understand why a company might not want to hire someone with a disability. From what I can tell there are two main reasons why employers shy away from hiring disabled people: the fear that they are not a good bet financially (i.e. they will not do the job as efficiently/will take too much time off work/will need too much help) and the fear of lawsuits. I think it’s fair to say that (usually) the first fear is unwarranted. People without disabilities play hooky, take time off to care for sick children, and sometimes have to take extended time off as well. Smokers alone statistically work far less efficiently than non-smokers and they aren’t considered disabled (don’t get me started). I think where things start to get sticky is the second fear. If an employer could fire an employee who was disabled as readily as they could fire a non-disabled worker, I whole-heartedly believe that more disabled workers would be in the labour force. If workers were really all equal then there would be no reason not to hire a disabled person; the worst case scenario would be that you would fire them. The current disability related laws are supposed be there to prevent nasty employers from discriminating against people with disabilities and to ensure that an employer makes reasonable accommodations so that their employee can do their job properly. This isn’t really all that different than it is for non-disabled employees. Companies make accommodations based on personal circumstances all the time because it’s in their best interest to do so financially (not to mention morally). No company wants to spend time and money training someone new, especially if the current employee is good at their job. But sadly, the system has been abused to the point that employers are scared, and I would argue somewhat legitimately, to hire anyone with a disability. People are screaming discrimination over ridiculous things and there seems to be an increasingly large group of people who feel that once they have a job they deserve to keep it for life just because they are disabled. A disabled employee should be subject to layoffs and job protocol just as much as any other employee. Take Glenn Krasner for example. He worked as a fire protection inspector in NYC for 19 years before he was fired. He suffers from Asperger’s syndrome and as a result was getting harder and harder to control as his employment continued. I feel like the FDNY went above and beyond to accommodate him, but in the end felt that he had gotten to a point where he could no longer do his job well enough to remain at the department. They went through a disciplinary hearing, which ultimately resulted in the termination of Krasner’s employement. But of course, Krasner wouldn’t accept the outcome; he turned around and sued the FDNY. He lost. But had the FDNY not gone through years of paperwork and administrative red tape he might have won. This is exactly the type of situation that lots of companies want to avoid. Whether or not it’s moral or fair, I can understand why a company would be hesitant to hire someone with a disability. It means potentially walking on egg shells. It means keeping a detailed paper trail of every interaction. It means potentially spending years in court fighting allegations. It’s an unfortunate side affect of the disability discrimination laws, but before we blindly attack the employer we must stop and think of it from their point of view. In order to move forward and be truly inclusive we need to take a look at our current system. Disabled workers have a lot of offer to the labour force, but our current system isn’t doing them (us) any favours. My hope is that one day we will live in a world where we don’t need laws to mandate kindness, compassion, or common sense.